Any Age. Any Skill Level. Lessons In Person or Remote. I'm proud to say that all of my Seattle students (private and group lessons) who competed to qualify for the Washington state tournament have qualified! I've only been coaching these students ranging from 3 to 7 months so this is a big accomplishment. They all played well at various state qualifiers where players must win 3 out of 5 to compete in the state tournament in April 2018! My student Vijay shown left holding the 3rd Place trophy he won at the qualifier he competed in. Way to go and congratulations to all of my students! If you are considering chess lessons I would highly recommend Charles. He has a deep understanding of the fundamentals of the game and can teach the nuances that can challenge the average player from becoming more solid and advanced at the game. I committed to 10 games and saw my chess.com rating increase by 250 points. That's great but what's better is that I actually enjoy playing the game a lot more because of the way Charles teaches. So if you are kind of stuck in a rut with your play and want to systematically get better call Charles. Fred Langer, Esq. Seattle's North Beach Chess Club had a successful representation at the Broadview Thompson Chess Tournament on November 18, 2017 placing 3rd Place in the Kindergarten-First Grade Category; the first time the club has placed in a tournament in the school's history! I began coaching the club in September 2017 and couldn't be prouder of the results we've achieved in such a short amount of time. Congratulations World Champ Rochelle Wu! I taught Rochelle Wu how to play chess using my winning methods. Today she is the #1-ranked under-12 female player in the world! 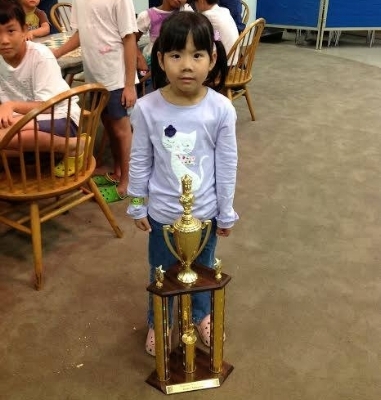 I'm proud to have been a part of her development as a chess player. I know her foundation is solid! Congratulations NATIONAL & AlaBAMA STATE CHAMPS! My students have won numerous team and individual championships and tournaments at the city, state, regional and national levels. I've produced two Alabama state champions, and currently coach the high school championship team in Alabama - accomplishments achieved within a few years with novice players. Chess is known to improve reading and math skills.. Coach Smith also specializes in facilitating professional development workshops to teach teachers the game of chess; enabling them to teach the game to their students. He is one of only eight people in the country to earn the title of National Chess Coach from the U.S. Chess Federation. Coach Smith was recently recognized by Madison City Schools as an outstanding chess coach after elementary students he had coached for three short months placed 2nd in the Alabama State Championship. The achievement was significant because it was the first time the chess team had placed in the state competition in the school's history! Don't let their innocent faces fool you! These kids will tear your head off in chess! Coach Smith's proprietary teaching method helps young players develop confidence, focus and 21st Century Skills. He has produced champions at all levels of chess and his track-record makes him the most winning chess coach in Alabama's state history.